PROVIDENCE, RI (Brown University) — Researchers from Brown University have discovered another peculiar and potentially useful property of graphene, one-atom-thick sheets of carbon, that could be useful in guiding nanoscale self-assembly or in analyzing DNA or other biomolecules. A study published in Proceedings of the Royal Society A demonstrates mathematically what happens to stacks of graphene sheets under slight lateral compression — a gentle squeeze from their sides. 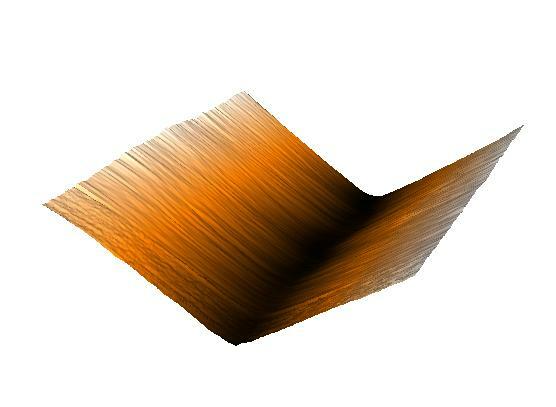 Rather than forming smooth, gently sloping warps and wrinkles across the surface, the researchers show that layered graphene forms sharp, saw-tooth kinks that turn out to have interesting electrical properties. "We call these quantum flexoelectric crinkles," said Kyung-Suk Kim, a professor in Brown's School of Engineering and the paper's senior author. "What's interesting about them is that each crinkle produces a remarkably thin line of intense electrical charge across the surface, which we think could be useful in a variety of applications." The charge, Kim says, is generated by the quantum behavior of electrons surrounding the carbon atoms in the graphene lattice. When the atomic layer is bent, the electron cloud becomes concentrated either above or below the layer plane. That electron concentration causes the bend to localize into a sharp point, and produces a line of electrical charge roughly one nanometer wide and running the length of the crinkle. The charge is negative across the tip of an upraised ridge and positive along the bottom of a valley. That electrical charge, Kim and his colleagues say, could be quite useful. It could, for example, be used to direct nanoscale self-assembly. The charged crinkles attract particles with an opposite charge, causing them to assemble along crinkle ridges or valleys. In fact, Kim says, particle assembly along crinkles has already been observed in previous experiments, but at the time the observations lacked a clear explanation. Those previous experiments involved graphene sheets and buckyballs — soccer-ball-shaped molecules formed by 60 carbon atoms. Researchers dumped buckyballs onto different kinds of graphene sheets and observed how they dispersed. In most cases, the buckyballs spread out randomly on a layer of graphene like marbles dropped on smooth wooden floor. But on one particular type of multilayer graphene known as HOPG, the balls would spontaneously assemble into straight chains stretching across the surface. Kim thinks flexoelectric crinkles can explain that strange behavior. "We know that HOPG naturally forms crinkles when it's produced," Kim said. "What we think is happening is that the line charge created by the crinkles causes the buckyballs, which have an electric dipole near the line charge, to line up." Similarly, strange behaviors have been seen in experiments with biomolecules like DNA and RNA on graphene. The molecules sometimes arrange themselves in peculiar patterns rather than flopping out randomly as one might expect. Kim and colleagues think that these effects can be traced to crinkles as well. Most biomolecules have an inherent negative electrical charge, which causes them to line up along positively charged crinkle valleys. It might be possible to engineer crinkled surfaces to take full advantage of the flexoelectric effect. For example, Kim envisions a crinkled surface that causes DNA molecules to be stretched out in straight lines making them easier to sequence. "Now that we understand why these molecules line up the way they do, we can think about making graphene surfaces with particular crinkle patterns to manipulate molecules in specific ways," Kim said. Kim's lab at Brown has been working for years on nanoscale wrinkles, crinkles, creases and folds. They've shown that the formation of these structures can be carefully controlled, bolstering the possibility of crinkled graphene tailored to a variety of applications. Kim's coauthors on the work were Mrityunjay Kothari, Moon-Hyun Cha. The work was supported by the National Science Foundation (CMMI-1462785, CMMI-1563591, DMR-0520651 and XSEDE).